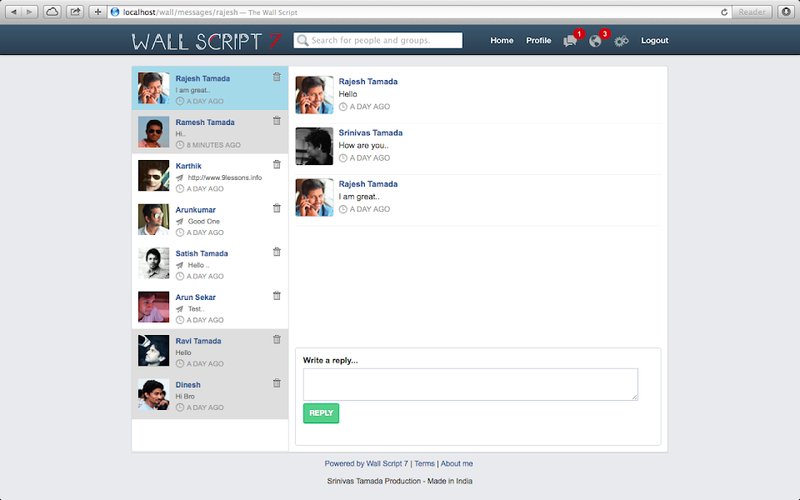 Wall Script 7 The Social Network Clone Script. 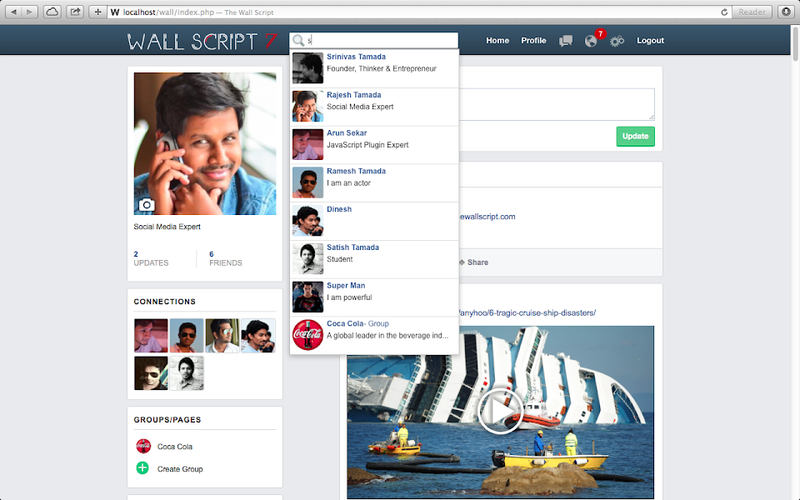 An insult made me to build the Wall Script a social network script built in PHP, Jquery, Oembed, OAuth and MySQL, now my life has been changed completely. 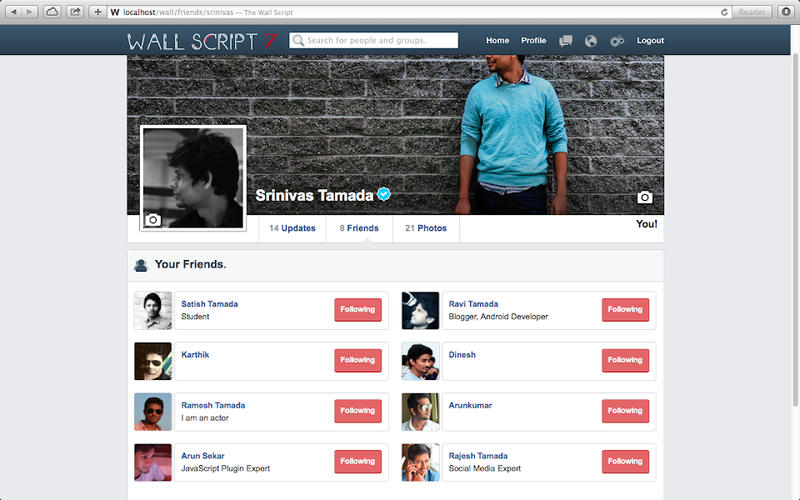 Last one year I received lots of requests from Wall Script 6 users that asked to me about more social features like Groups/Page, Notifications, Photo Album and Admin Control. 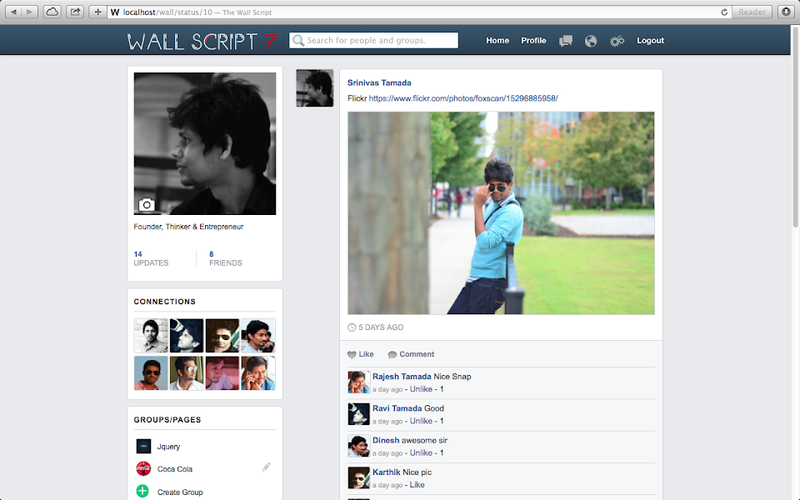 Today I am introducing the most improved Wall Script 7 with lots of social network features. 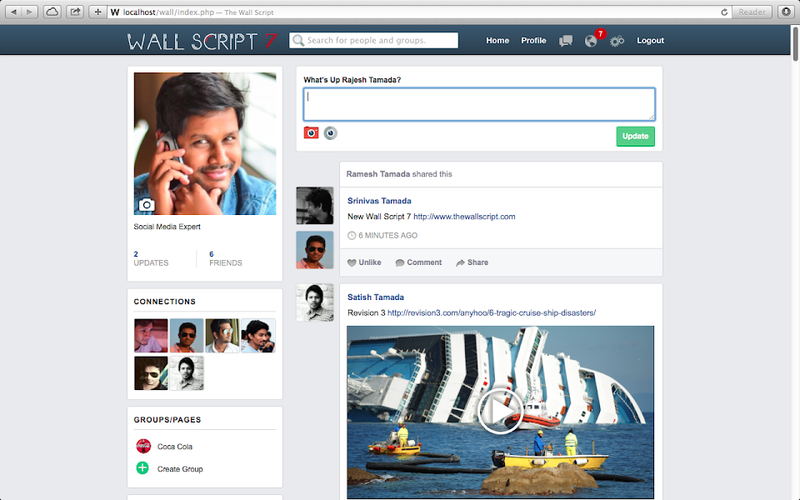 This script is a collaboration of 9lessons.info tutorials and adopted Twitter and Facebook social features, sure Wall Script 7 helps you to understand social networking system in a simple way. 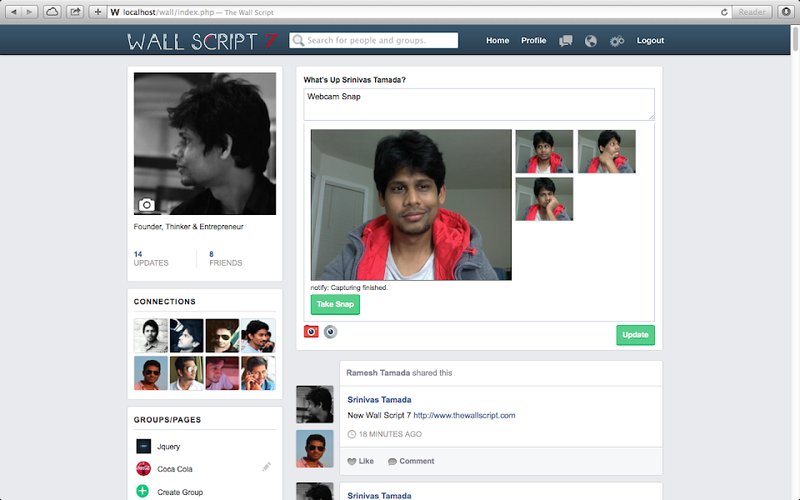 Everything, introducing most awesome social network features such as Groups/Pages, Notification, Timeline, Photo Albums, Private Conversations, Like/Share Updates, Webcam Snaps and Oembed expanding URL system. Please take a quick look at this demo. Note: After the payment is successful, you will get wall.zip file from [email protected] within 24 hours. If you have any further queries then you can contact on this mail id. 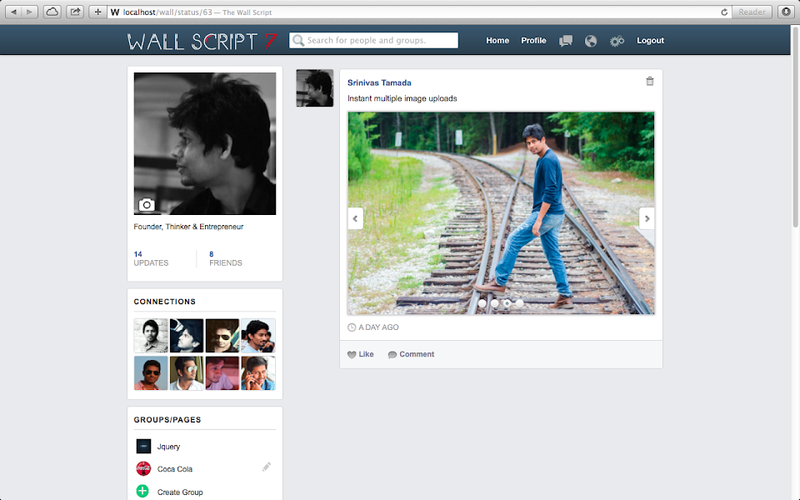 Awesome Srinivas this looks more advanced version of wall ! 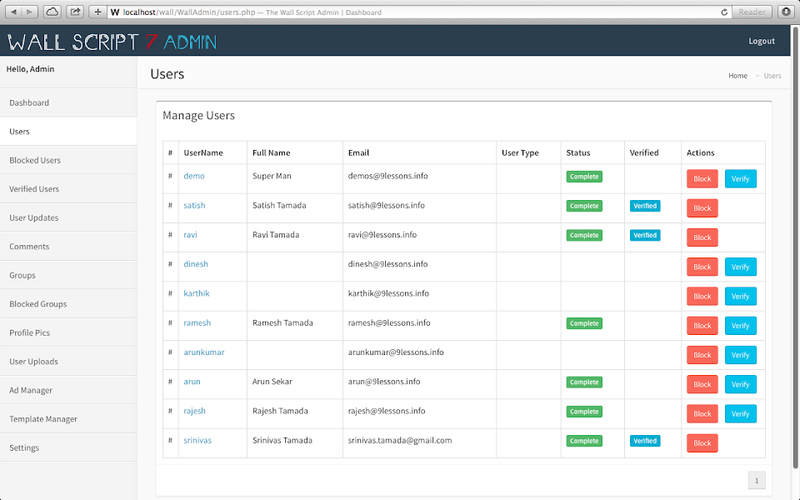 I loved the admin panel most! 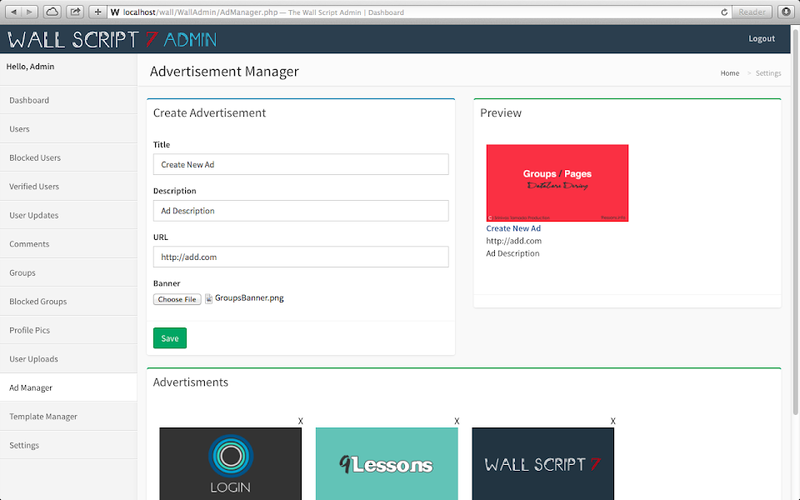 have a online demo ? Tamada, you are very good at it , congratulations ! I just have purchased the version 6 of this script (last month). At that time there were no version 7 of it. Do I need to purchase it again, just to update to version 7????????????????? 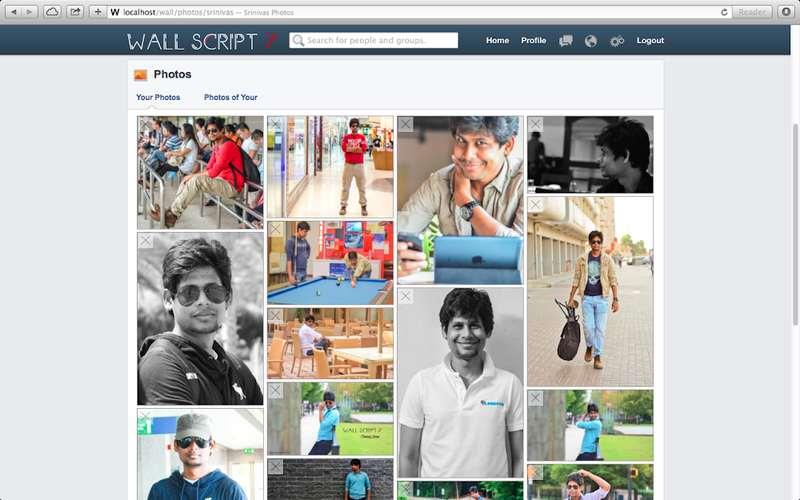 @zeeshanakhter2009 Wall.zip contains upgrade.sql, you can import with Wall 6.0 database. Before trying this please take your database backup. Great script, bro. I really like the new features introduced in the new version. Wondering , what that insult was? may we know about that? your are very thankful to them who insult you.may we know who is he/she? 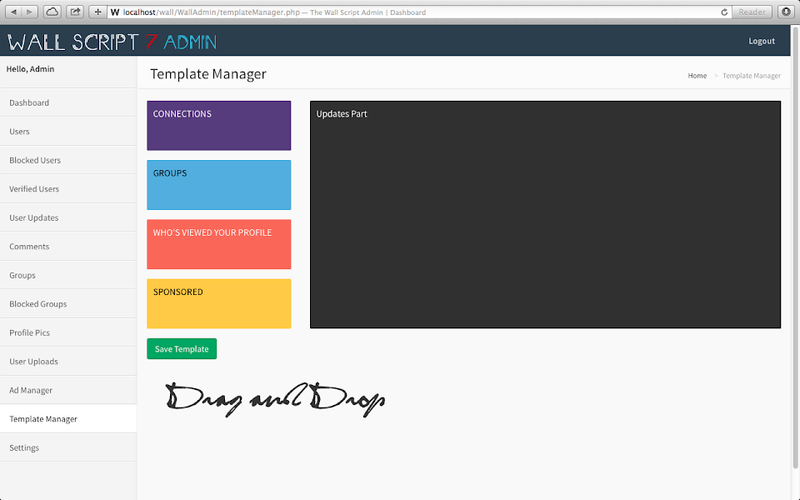 @Sergio Aguiar Wall Script 6.0 uses can buy an upgrade. Where I can see live demo? Wow! 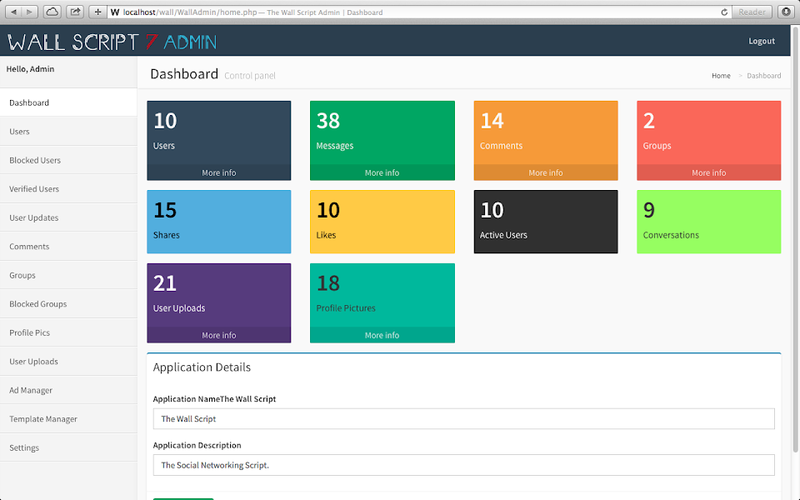 looks like this will be great on the desktop, but does it adapt responsively for mobile and tablet users? Dear brother Is there a private chat site? 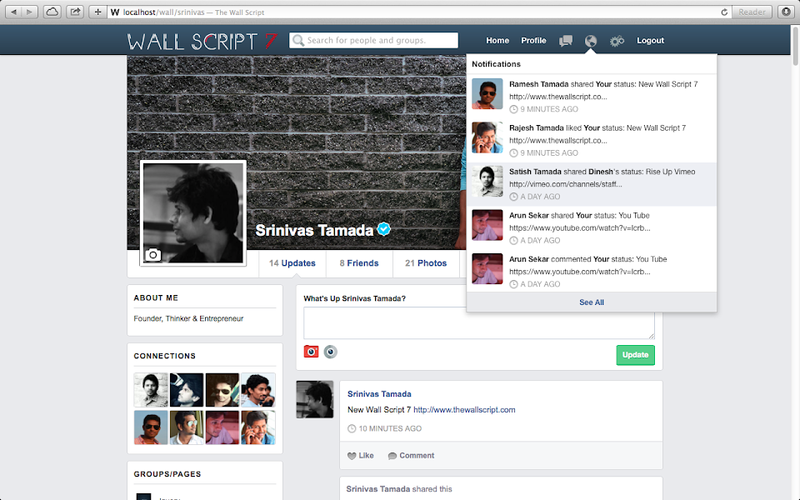 Srinivas your CloneScript is good but you should add collapse text on wall post. Because it takes up a lot of space in the long articles page. I made this plugin and is currently running. 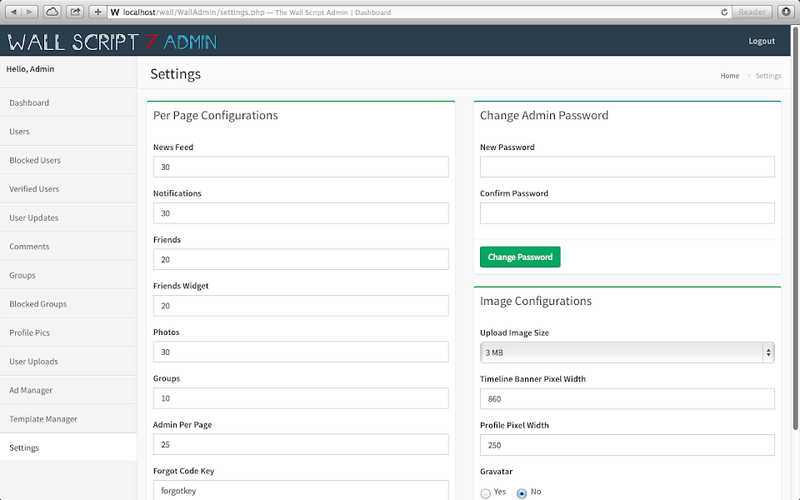 can we send forgot password email even in localhost? 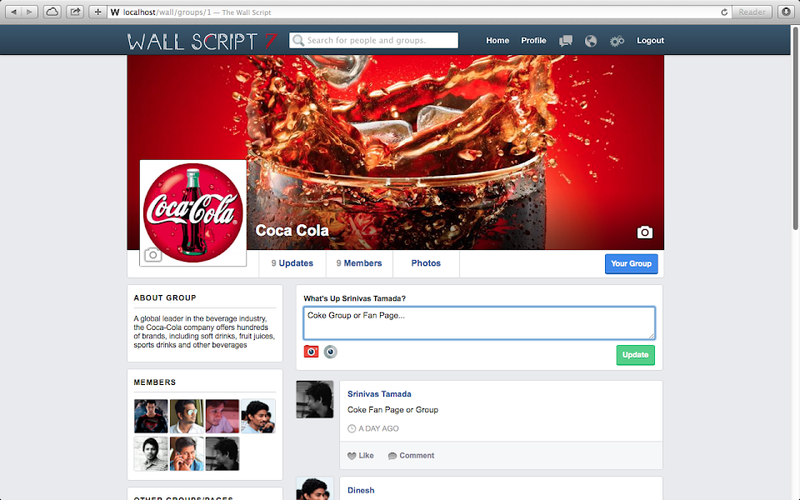 Any chance for Wall Script in .Net MVC? Please add a third collumn on the next version of Wall Script..
Great work brother... Your Generous. Please may you create an online user box in the next vesion to help user to recognize online friends? Also may you add people you may know so that user can find new friends.. Please May you create the third column on the next vesion? 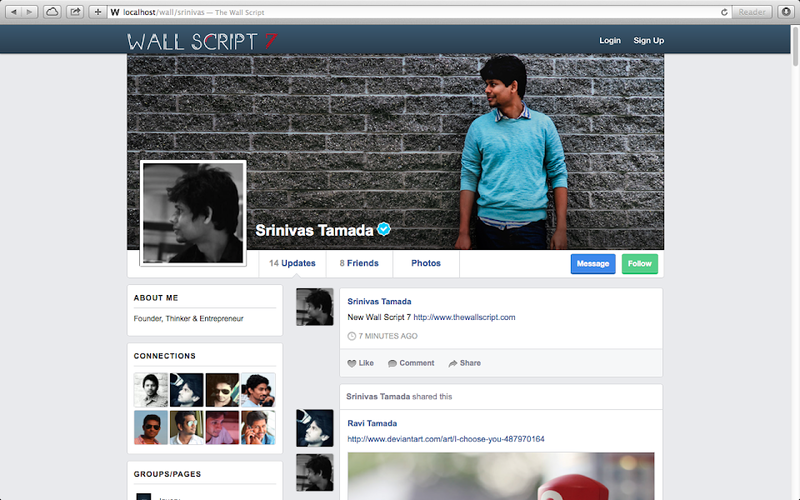 LOVE YOU BRO.... KEEP ON CODING,YOU SURELY GONNA ACHIEVE YOUR GOAL. THANKS FOR YOUR EFFORTS.